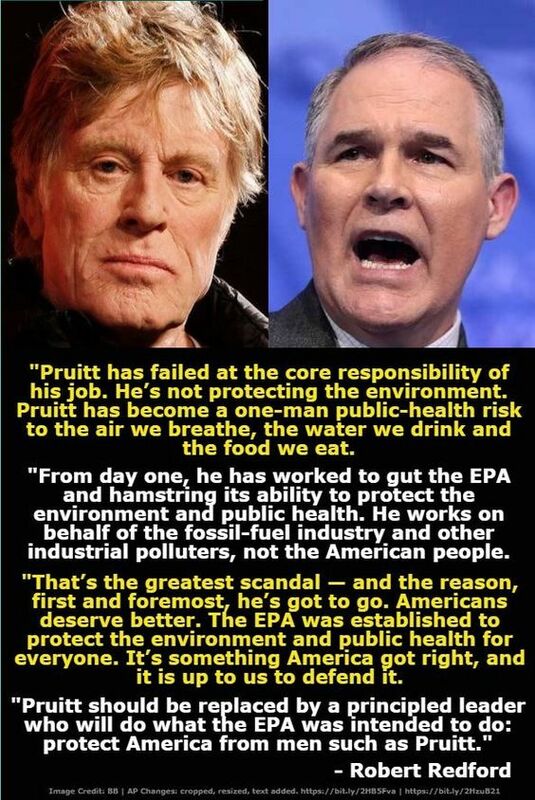 I have no difficulty in completely agreeing with Redford’s statement concerning Scott Pruitt. Like so many (the majority) of Trump’s Cabinet Appointees, he is a walking disaster bent on destroying the agency he is supposed to lead. He doesn’t even attempt to hide his unbridled greed and corruption. Scott Pruitt needs to be fired, replaced, indicted and tried for crimes against the American people. This entry was posted in News & Views, Quotes and tagged air, corruption, crimes, environment, Environmental Protection Agency, EPA, failure, fossil fuel, greed, indictment, princioled leader, protection, public health, responsibility, risk, Robert Redford, scandal, Scott Pruitt, water on May 5, 2018 by Ray Buchanan. Not everyone would agree with Dr. King’s statement. I do. For me it’s a spiritual issue. But, I also understand that if one does disobey unjust laws there are consequences. What do think? Does our moral responsibility include disobeying laws we feel are unjust? If so, why? This entry was posted in News & Views, Quotes, Spirituality & Religious Writings and tagged consequences, Martin Luther King Jr, morality, quote, responsibility, spirituality, unjust laws on March 14, 2018 by Ray Buchanan. We all knew what #BLOTUS was before he was elected and we all know what he still is today. Yet, he was still elected to the highest office in the United States. Why? Since his election has he done anything other than reinforce what we have known all along? I think not. Why is he allowed to remain in office? Why is he allowed to continue embarrassing our country every time he opens his filthy mouth? Why doesn’t the Republican-led Congress hold him accountable for his lies and total disregard for the law? Why aren’t we all outraged enough to act? I have never been more ashamed of my country’s leaders as I am today. Am I the only one? This entry was posted in Facts & Statistics, News & Views, Quotes and tagged accountablity, action, BLOTUS, Congress, difference, Donald Trump, feuds, Hillary Clinton, ideas, incoherent, knowledge, lies, national embarrassment, outrage, quote, rants, Republican, responsibility, shame, stability, unfit on June 30, 2017 by Ray Buchanan. It is difficult for me to comprehend how the values of our nation have apparently changed. We seem to have thrown away our moral compass and are intentionally fleeing from the responsibilities that have long demonstrated our greatness. I totally agree that we need to make our nation great again. But endorsing the bullying, selfish, xenophobic, and racist values of the president elect moves us further from that goal. The values of BLOTUS are not the values that will make America (or any other nation) great again. Have we really come to the place where we have decided hate is better than love? Do we really want to live in fear rather than caring for those most in need? What has happened to our sense of justice for all and compassion for those in trouble? We definitely need to look into a mirror. We need a rude awaking to see what we are becoming. The United States doesn’t need a wall. We need a heart. This entry was posted in News & Views, Quotes and tagged BLOTUS, bullying, compassion., Donald Trump, fear, forgetting, greatness, heart, mirror, moral compass, President elect, racist, reflection, responsibility, selishness, US, values, wall, xenohobic on January 14, 2017 by Ray Buchanan. This entry was posted in Facts & Statistics, Hunger & Poverty, News & Views, Quotes and tagged author, billionaires, caring, compassion., fantasy, Forbes, giving, Harry Potter, intelligence, J. K. Rowling, magic, money, morality, quotes, responsibility, status, wealth, wisdom, writer on August 20, 2016 by Ray Buchanan. This entry was posted in News & Views, Quotes and tagged caring, compassion., helping, life, meaning, Mollie Marti, need, quotes, responsibility on August 2, 2016 by Ray Buchanan. Not all 19 year olds are created equal. When I was 19 I didn’t have a gun. I had a rifle. 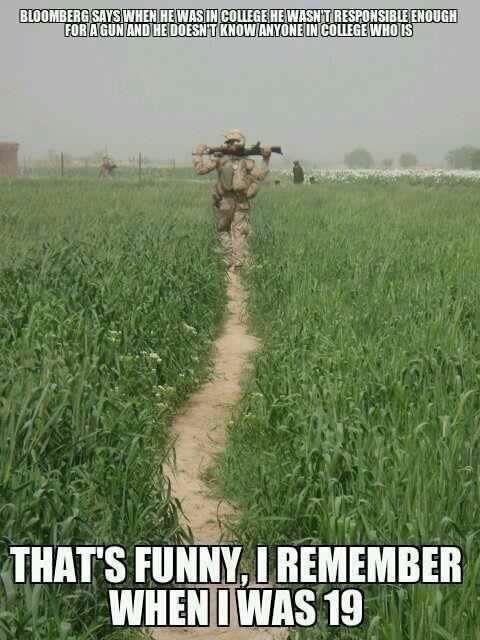 And my life and the lives of all my fellow Marines around me depended on it. But then Mt Bloomberg didn’t go to Viet Nam and never faced someone whose sole purpose in life was to end yours. This entry was posted in News & Views and tagged Bloomberg, college, gun control, Marines, military, responsibility, USMAC, veterans, Viet Nam, war on February 22, 2016 by Ray Buchanan. As I have said before, sometimes silence isn’t golden. Sometimes remaining silence is just plain yellow. Allowing others to be humiliated without speaking up and coming to their defense cannot be justified. If we see suffering and do not act to defend those being oppressed we become as responsible, as guilty, as the oppressors. This entry was posted in Hunger & Poverty, Quotes, Spirituality & Religious Writings and tagged Elie Wiesel, guilt, Holocaust, humiliation, neutrality, oppression, responsibility, silence, suffering, survivor, victim, violence on January 30, 2016 by Ray Buchanan.